1968 Cheltenham Gloucestershire. You can see more on You Tube "Modern Rescue Appliance Demonstration (1967)". Not sure of bodybuilder. Possibly HCB? Nice shot of a bygone era, including one of the eleven very utilitarian D600 HCB Water Tenders I was involved in selling to Gloucestershire that year. As can easily be seen, these had a separate crew cab and retained the standard tilting Ford factory lorry cab. Communication was effectuated by removing the rear cab window and fitting a monster rubber grommet to keep (most of) the rain out! 1- These were the first D series fire appliances sold in the UK, leading to sales to eventually around thirty British fire brigades. 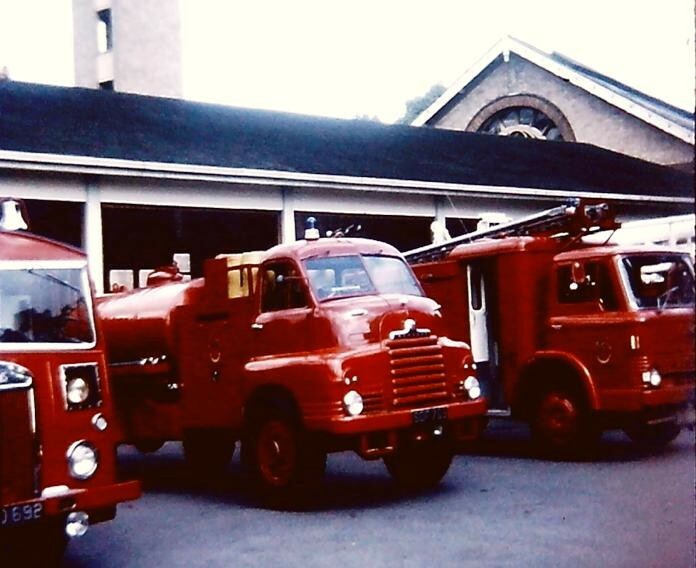 2- They were my first fire engine sales, too! Both Carmichael and HCB quickly figured out how to build a much better looking split tilt cab on the D chassis, and Merryweather had Reliant build a full tilt crew cab, which seems to have been quite well executed. Added by Rob Johnson on 02 November 2018. HCB bodied the Ford D series water tender sitting next to it. This was one of the first eleven D series sold in the UK for fire appliance use in 1967. Added by Rob Johnson on 06 November 2018.